The mathematical background of the teacher is the number one predictor of student success. Teachers who lack conceptual understanding of math benefit from the daily support provided by the scripted lesson plans using manipulatives. 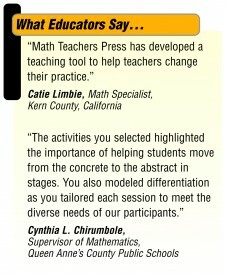 Moving with Math® professional development is designed to assist teachers implementing the Moving with Math® programs. The goals are to help teachers use data driven instruction and research-based strategies to address the needs of struggling learners. Teachers will participate in hands-on activities related to the weakest skills. Implementation workshops are 1–3 hours and are complimentary for qualified orders. Moving with Math® programs are well organized and easy to use. You may choose from half-day, full-day, or 2–4 consecutive days. Sessions are customized to meet your needs. Boxed kits contain all the training materials your staff needs to conduct workshops on their own. Each kit includes a presenter’s guide, teacher handbooks, overhead transparencies, overhead materials, game sheets, dice, and cards.